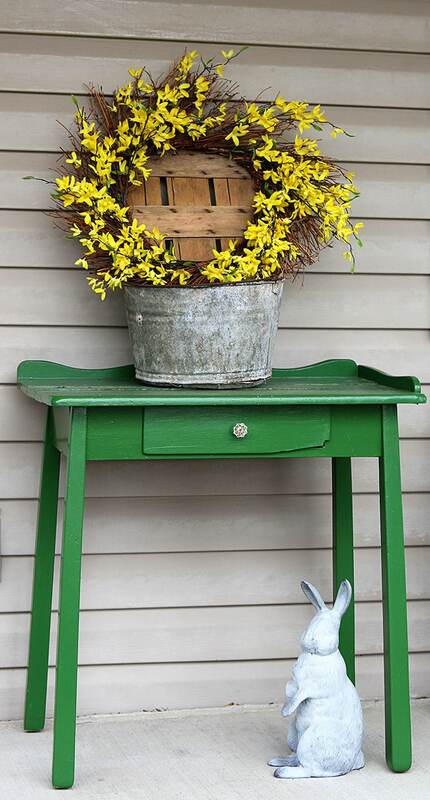 A simple and easy farmhouse spring porch decor idea made with things found in the shed. Truly spring decorating on a budget! The weather has been teasing us this week. It’s trying to act like it’s spring, but I know winter is just going to come back and give us a slap alongside the head before long. I’m not done with you yet! But it is getting me in the mood to get a little spring decorating done around the house. This is a little vignette I made for the front porch. 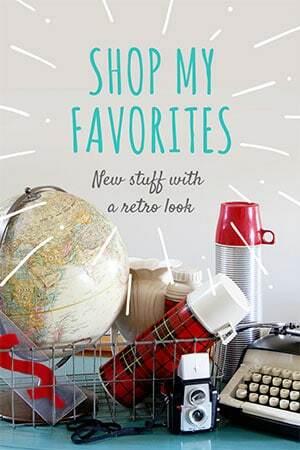 It has a rustic, farmhouse, just-using-whatever-the-heck-I-had-in-the-garage type of theme. Or I guess you could call it my farmhouse spring porch decor. If you want to get all fancy. And actually this isn’t the whole porch “reveal”. I’ll save that for later in the month when I actually have more than this two by three foot section of the porch done. It’s times like these when I’m happy that I never put away the bunny from last spring. Sure, I was cussing at the poor thing in November when I was tripping over it in the garage trying to get to the snow shovel. But all is good with Mr. Bunny and me now. And the best part is, it took me all of ten minutes to make this whole vignette. I know! You’re shocked, right! Oops, forgot to clean off the table. Maybe ten minutes was too quick after all. I has used the green table on my Traditional Christmas Porch and before that it was painted yellow for my Fall Farmhouse Porch. I was THIS close to getting rid of that table last summer, but I’m glad I kept it around a little bit longer. 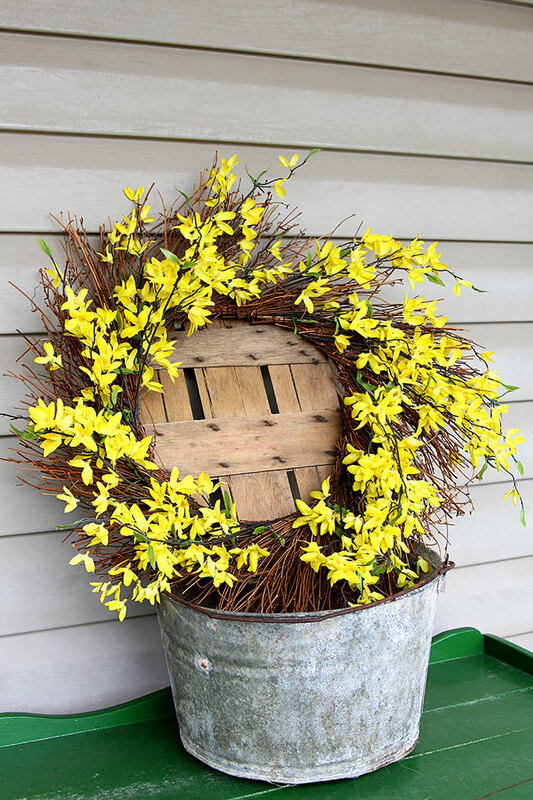 I decided to just set my forsythia wreath in a bucket instead of hanging it on the door like a normal person would do. Last year it kept blowing down and the fake forsythia branches ended up strewn all over the yard. I figure this way it doesn’t have far to fall and if branches do pop off, maybe they’ll just end up all tidy-like in the bucket (in my dreams). How’s your spring decor coming along? Thanks Stacy! I always try to dress up the porch for the UPS man 🙂 He’s about the only one who ever gets to see it in person! I like it!! Still too cold to put anything out yet, but I’ve been collecting and reinventing some things! We have to keep remembering that it’s only early March! The warmer weather here in eastern PA that is SO early is a real tease! Yes, patience!! That’s ok, I just took down the Christmas greenery that was on my deer head yesterday. It’s been there so long that I just thought it looked normal. And then you could hang flags on it for the 4th of July!!! Not, is how mine is coming. I’m too busy trying to figure out the rest of the kitchen. I hope I make it around to a little Easter decoration at some point. Oh, and if it’s outside, it’s “supposed” to have a little dirt. Hence the word, outside. 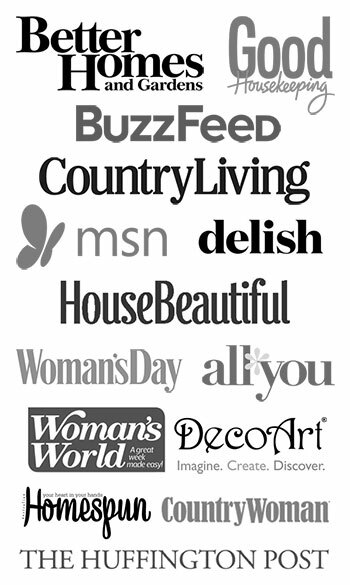 Is there any way you can make this font bigger? Geez, I love ya, Pam, but I can’t hardly even see it! I feel like I’m having an eye test and this is the smallest row. Pam, your ‘grab and throw’ technique is wonderful! My front door is naked right now. Usually don’t get through March here without a March Madness snow storm. 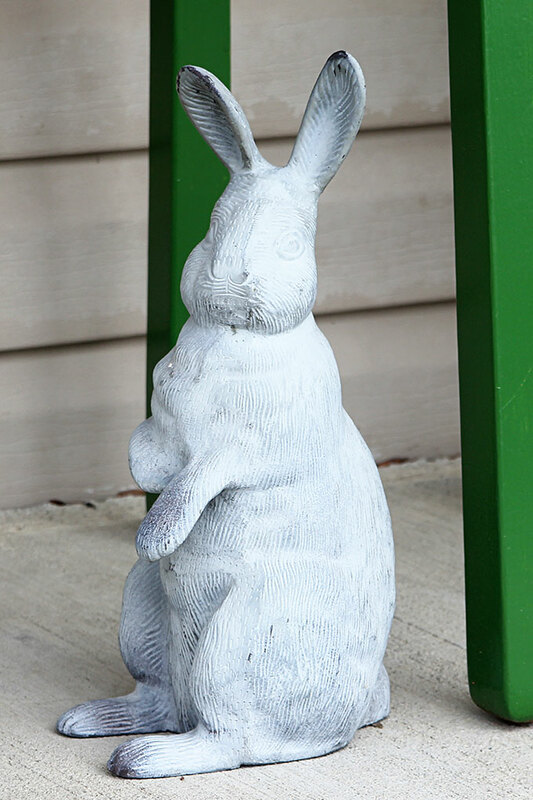 Still, have started putting out some Easter decorations in the yard, we’ll see if they stay put. it make a great base for their nest. Your porch looks great and you gave me an idea! Last fall I painted a little step ladder green. Its about 5 feet tall and would look fantastic with a forsythia wreath hanging on it. That would make a nice simple statement! You had me at galvanized bucket . . . . it’s cute and country!!! OMG! Do not get rid of that adorable little table! It’s just perfect for holding a spring (or whatever season) welcome grouping. Green and yellow just say spring to me. I have done absolutely nothing as far as spring decorating. I finally got hit with the respiratory bug that EVERYBODY around me has been spreading. Cover your mouths people! :o) Enjoy your early teaser spring before you get smacked upside the head, Pam. 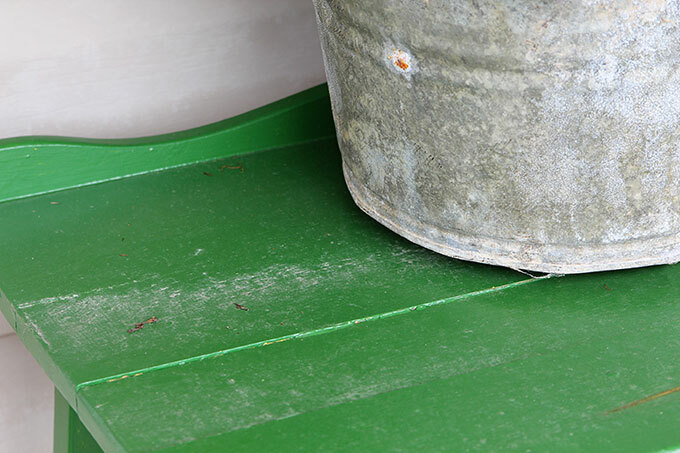 If you ever sell that green table at a garage sale…I would drive from Mi to buy it! I’ll let you know if I do 🙂 I’ll keep it there for spring at least and then who knows, I only have so much room to store stuff! What a beautiful display! We just moved and our new house has double doors so I feel as though I must have two of anything that I want to hang on the door. Since we do have a little porch area next to the door, this is a wonderful way for me to be able to continue to display old wreaths, along with buying new ones, without having to have two! I have to ask – what color green did you paint the table? It is beautiful – so springy, and absolutely perfect with the Forsythia! Looking forward to many more wonderful posts. It was one of Martha Stewart Living’s paint colors they used to sell at Home Depot called Bay Leaf. I’m not sure where they sell her paints anymore. It is a beautiful springy color!